Lutie Stearns was a founding member of the Wisconsin Free Library Commission, started in 1895. In 1896, she worked with local philanthropist Senator James Stout to establish 16 traveling libraries in Dunn County, each town getting a case of about 30 books. Each community had to establish a group of people to oversee the collection and pick a volunteer to manage it daily. This would be the basic blueprint for the traveling libraries Stearns would form in the future. Ready to Go! The first batch of traveling libraries await shipment in Stout, WI. The two on top are open for display. Courtesy of the Wisconsin Historical Society. In 1897 Wisconsin’s Legislature granted the WFLC an additional $4,000, with Lutie Stearns as a full time employee. 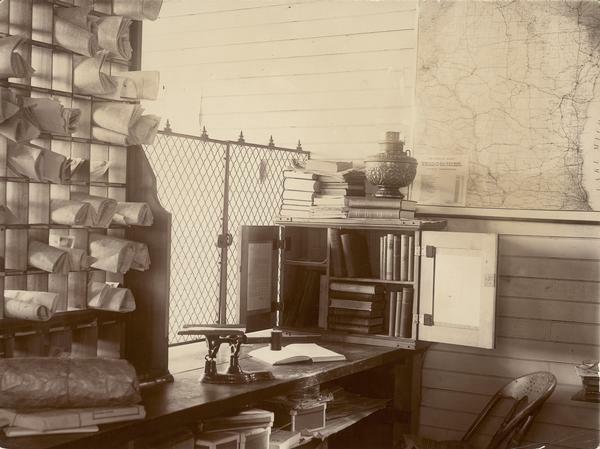 As the Commission’s official Organizer of Traveling Libraries, she rode all over the state, by carriage or horse-drawn sleigh, each time her mission the same: to convince the town’s citizens to invest in a library. The basic setup called for the township to put up $50 for the upkeep of $1,000 worth of books from the WFLC. The boxes typically numbered 100 volumes, kept in a double-doored case with a shelf. The titles were an eclectic mix of children’s and adult book, fiction and nonfiction, and often written in a diversity of Germanic and Scandinavian languages. Robinson Crusoe and Hans Brinker were among the books for children; Sherlock Holmes and Shakespeare entertained adults. Also included were cookbooks (The Boston Cookbook), history (Oman’s History of Greece; Higgins’ English History for Americans), and books on farming (First Principles of Agriculture). Often, magazines were included that didn’t need to be returned (St. Nicolas Magazine). Along with the books came a list of simple rules and borrower cards for keeping track of titles. The town had to have a board that would oversee the collection, meaning they were charged with finding a suitable location and volunteers to manage the books. Above all else, the books had to be loaned out for free. One of Stearns’ free libraries, in the back of a post office. Courtesy of the Wisconsin Historical Society. 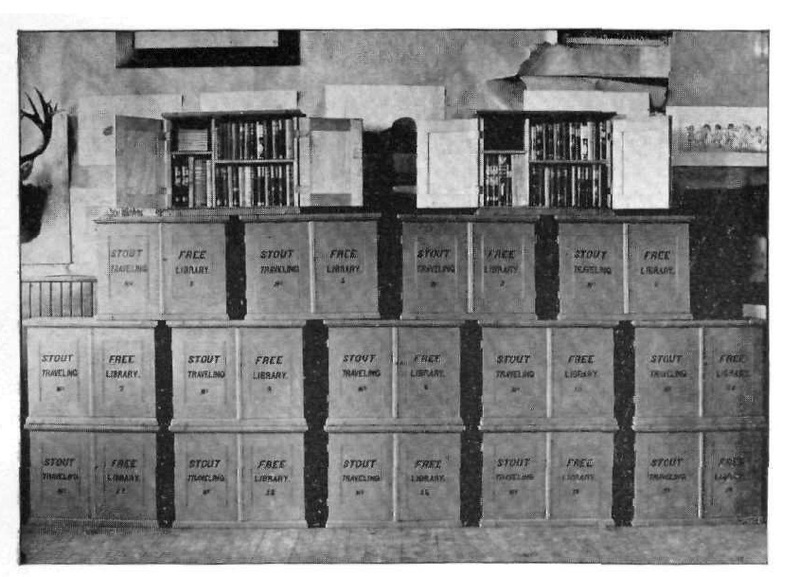 The portable library’s location could be basically anywhere that had a countertop, including post offices, creameries, general stores, and private homes. The WFLC also organized book cases for orphanages, tuberculosis sanatoria, and lumber camps. The Commission typically switched out the books every few months. Eventually Stearns earned the nick-name the “Johnny Appleseed of traveling libraries” and for good reason; in nearly 20 years she established over 1,400 such libraries in Wisconsin. Later, she helped dozens of Wisconsin communities apply for grants from the Carnegie Foundation to establish permanent libraries, many of which are still standing. 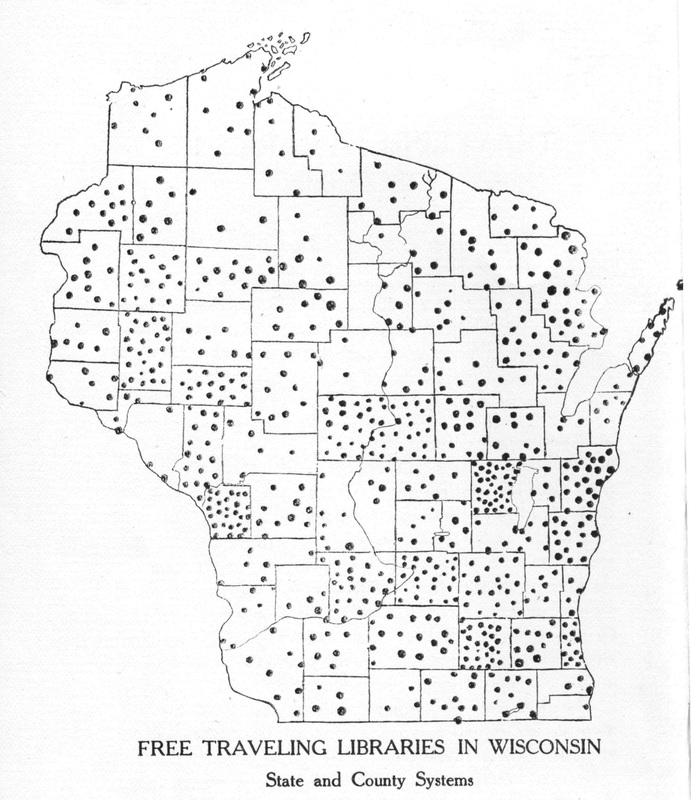 This map, which appeared in a turn-of-the-century pamphlet titled Free Traveling Libraries in Wisconsin, is a testament to Lutie Stearns’ legacy. Each dot represents a community she convinced to invest in a traveling library. This entry was posted in 1900-1920. Bookmark the permalink. While writing Last Chance Harbor, about first-grade teacher, Julianne Dickinson and Ryder McLachlan, I came across inspiring stories involving countless educators and librarians around the US, people who went to great lengths to make sure books were made available to anyone who wanted them. One such lady was a woman by the name of Lutie Stearns. Miss Stearns was a founding member of the Wisconsin Free Library Commission who worked throughout her county to get books into the hands of readers. Between 1895 and 1914, Lutie established “little traveling libraries” with the help of philanthropist, James Stout. Here is a great blog post that tells the story about the first Bookmobiles and the dedication of one woman to see it through and make it a success.